I will begin again with the stories, though I fear I am drawing out a thing unfinished, moving still in half-light... Age continues with its backward glances, with all its ghosts, and one layer of stone settles on another. Reading Ogam is a bardic art, a poetic endeavour. Word-Ogam associations are keys to a journey into myth. 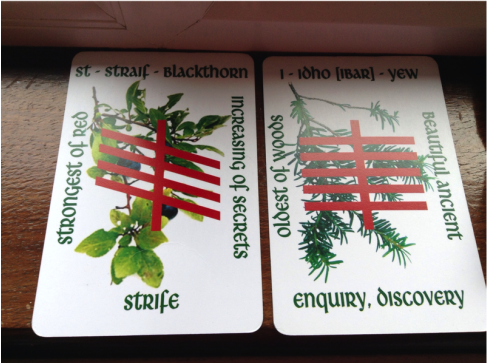 Ogham cards by the British Druid Order. I also have a set of beautiful wooden staves. My Ogam readings draw largely from the traditional sources (such as the 'kennings') and Irish myths, as well as from my own imbas (personal inspiration). Although I sometimes also draw on the tree lore, that's not a key focus for me. Instead, much like the runes, each Ogam letter is associated with words or symbols, its associations coming from mythology and poetry. Expect a reading rooted in Gaelic myth, Otherworldly symbols, and the world of the gods, spirits and ancestors. Currently offering readings in exchange for donations. Pay what you think the reading is worth. Use the contact form below to enquire about a reading.